“All good things must come to an end…”, so goes the popular saying. But sometimes, they just keep getting better! 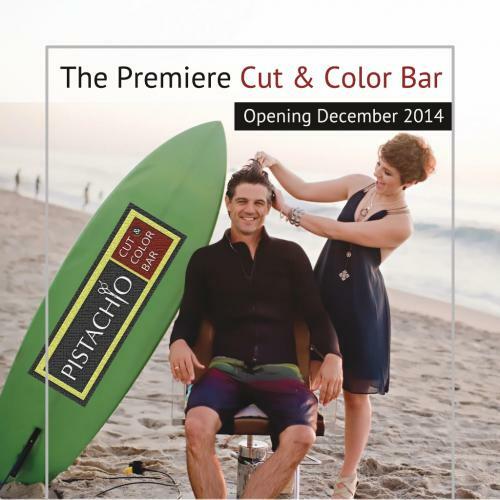 And that’s exactly what we have planned for the brand new “Pistachio Cut & Color Bar” opening this December at the Plaza Paseo Real in Carlsbad. True to form, Pistachio continues to innovate with the introduction of the Cut & Color Bar. The first of its kind in our area, the Cut & Color Bar is a modern rendition of the European style hair studio. A specialized bar system will deliver maximum convenience and value to modern, time pressed, fashion conscious clients. With appointments in about an hour, clients will have access to certified Aveda, Davines and Eufora hair specialists in a clean, modern and fun environment. Pistachio Cut & Color bar will continue to employ the Aveda, Davines and Eufora education program. Teaching our stylists numerous cutting techniques and variations ensures that our clients get the customized look they want. Our program also teaches the latest hair color techniques and technology to ensure that the one-of-a-kind results never fail to impress. Located a short drive to the west from our current location, the new Pistachio will be the latest addition to this established neighborhood shopping center that’s anchored by The City of Carlsbad’s renowned Dove Library, the U.S. Post Office, Cinépolis Cinema, and the Aviara Vons. A large lounge area is located right next to our studio and served by the ever-popular La Costa Coffee Roasting. For your convenience, a professional Color Nails salon is located right next door. And for your dining enjoyment, the Plaza is served by innovative new food establishments such as the Beach Plumb and Tin Leaf Fresh Kitchens and much more! With no appointment necessary and an menu offering attractive package pricing, clients are assured a hassle-free experience that translates to easy salon visits and in between service appointments to keep your hair looking beautiful at a great value. Please reference the map for directions to Plaza Paseo Real, studio location and suggested parking areas.